Bartender of twenty years and first time entrepreneur Michael Lombardozzi is set to open his new tiki bar in Bushwick, Dromedary Bar, hopefully by mid-December. 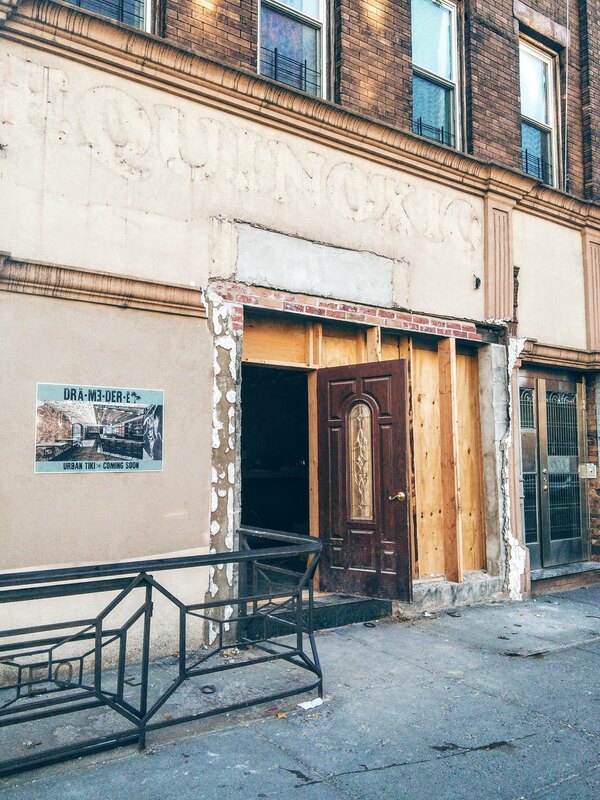 Previously a catering hall called Equinoxia, Dromedary Bar is located at 266 Irving Avenue in Bushwick, and will have neighbors in Lucy’s Vietnamese Kitchen, Pizza Party, and Boobie Trap. Noting that seventy to ninety percent of the menu will be tiki influenced, Dromedary will be offering a less traditional take on tiki. “Calling it a tiki bar locks you in with what you can do,” Michael says, which is why he wants you to use the prefixes of urban or non-traditional instead. Like, they might have Budweiser on tap, and they may or may not want to serve you a cricket (not alive guys, chill out) atop a deviled egg. A bit down the road, Michael pictures offering tickets for Monday Movie Nights + dinner with post-movie trivia and, yes, prizes! Sounds like a pretty solid Monday date night to keep in your back pocket. Citing that his fine dining cocktail culture is his specialty, Lombardozzi wants to spin things up a little with what you think when you think piña colada: instead of rum, coconut, and pineapple, there will be date-nut orgeat, absinthe, blood orange, rum, and pineapple served inside of a coconut (enough for two or more people). He has Kona brewery locked down for beer drinkers, with high hopes of offering Maui Brewing Co. in the future. Seems like we can expect pretty standard drink prices for the area, too, as prices are roughly broken down like this: $10.00-12.00 for specialty cocktails, beer from $6 and up, and beer + shot specials for either $5.00 or $6.00. The scorpion bowls and half coconut piña colada will be a bit pricier since they’re meant for two or more people. Michael is accepting sweet mug donations to fill out a tiki cabinet to showcase tiki mugs. They will accommodate sixty-four seats, which includes ten tables, sixteen fixed chairs at the bar from restoration hardware, and a banquette leading to a back area which can fit around twenty people. Take away the 1950s vibe and faux grass that comes to mind when you close your eyes and think of a tiki bar, then replace it with a more familiar industrial design that includes a chalkboard wall for local artists to showcase their work on a rolling, monthly basis. The Bushwick Collective will be doing art on the outside side of the building--a gated side wall, which means yes: there will be seating out there when it’s warm. Michael invites you to imagine “being in a tropical atmosphere in the middle of winter in New York City” and how much you’ll need Dromedary Bar after the cuteness of you wearing three cardigans and a turtleneck fades. Nostalgia will be ever present in Dromedary Bar. As a boy growing up in Bensonhurst, Michael loved playing Scully on the sidewalks, so he had this great idea to pay homage to that great childhood memory by giving every customer at his bar the opportunity to learn it. The concrete table tops will serve as the board, directions included, and Michael is working on a way where he can melt crayons into bottlecaps for the pieces. The child in all of us has missed doing weird things like melting crayons over bottle caps, or if you were me: gluing crayons to the inside of my first grade desk. There will also be vintage board games if you’re still having trouble honing into the moment, giving you an opportunity to take a break from that darn Klaus Teuber game you haven’t stop playing since 2010. 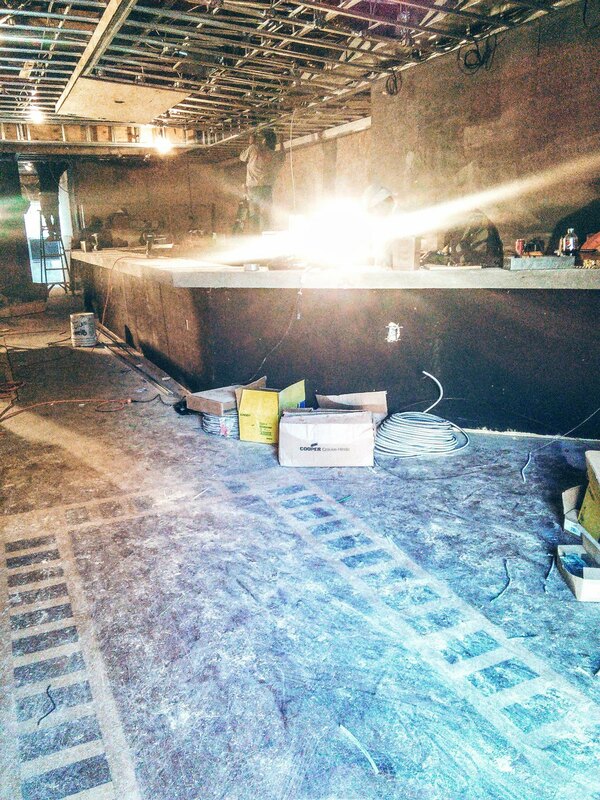 The food will mainly be Hawaiian influenced with the core of Dromedary Bar’s menu based on roughly ten different sandwiches, with appetizers and sharing items as well. Sandwiches will be from $10.00-$15.00, and smaller menu items will be anywhere from $5.00-$9.00. While mentioning a very recent Bushwick Daily article on cricket bitters as being a sign to him that putting crickets on his menu will work - because, let’s face it, having fried crickets on your menu makes you stand apart whether or not you’re a non-traditional tiki bar - Michael admitted that he is afraid of bugs, and then said that he’s very scared to open Dromedary Bar. “Opening your own bar is the most frightening thing I've ever done. Being afraid of insects I figured why not combine the two and incorporate crickets into my food menu? This way I'll deal with my lesser fear at the same time while having fun doing it,” he says. Stay tuned for the opening. 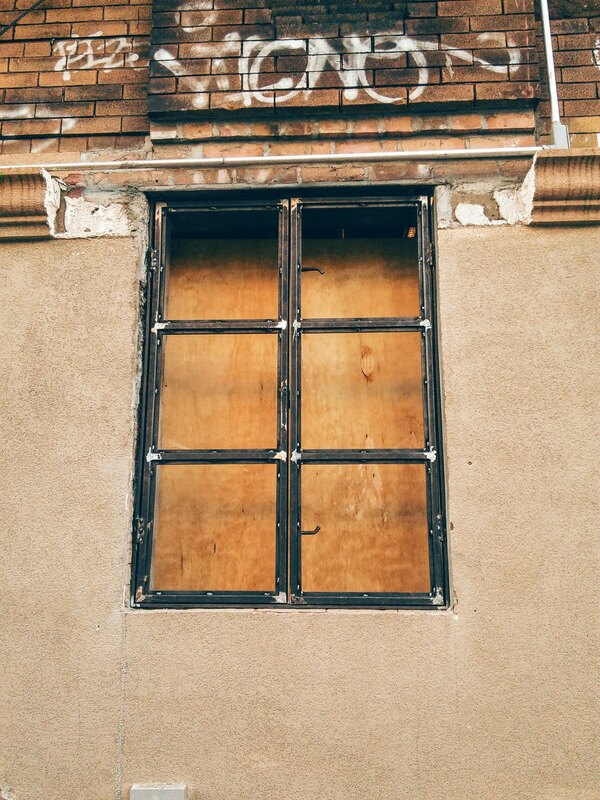 Dromedary Bar is hoping for a mid-December opening and is located at 266 Irving Avenue, Bushwick between the Central M and L & M Myrtle Wyckoff Ave subway stations.